Please include the breakfast with the price you are charging. The opening of the door outside was a bit of a problem. If you have forgotten your key in the room, or in your pocket, it takes so long for the receptionist to open for your own guest. He/she could be hurt I front of your hotel yet, that’s the only place he/she calls home in Paris. Think on how to balance the security issue in general and the security of your own client outside trying to wave for a receptionist to open. There was this particular black lady who welcomed me into the hotel, she was not kind at all. You can crosscheck from the system who that was. I was not please with the way she received me at the hotel. I am black so it should not be an issue of color. Otherwise the rest of the team was good. Thank you. Ok location, close to the metro station Plaisance (5 min walk) with easy access to every tourist attraction in Paris. Shops and restaurants very close by, on the street. Staff very friendly and helpful. Well equipped small apartment for a family of four. Very clean. Great free WiFi Internet access. Free coffee 24/7. Good A/C. Very comfortable beds. The pull out beds in the living room were perfect for my two kids. An actual 1BR apartment in Paris with kitchen (not a typical hotel room). The front desk staff were FANTASTIC! The mattress, pillow and flow of hot water were great! I know that sounds funny but those are, after all, the crucial elements. The staff was extremely helpful. ALL their directions worked out -- we got to our destinations and made it back to the hotel lol. Good size of room, kitchen equipment complete, free coffee! Nice to have the kitchenettes. There was a couple items of repair that were taken care of right away. Bus is across the street and a grocery store next door. Residential neighborhood is quiet and not "touristy" but only minutes from center of the hustle and bustle. I like to be slightly removed from the craziness and I always stay at this location. location was good, clean, nice and spacious rooms with kitchen. One of our top picks in Paris.In the 14th district in Paris, the Citadines Didot Montparnasse apartment-style hotel is less than half a mile from Plaisance Metro Station. It has classic studios and apartments with satellite TV and free internet access. All of the air-conditioned accommodations have a kitchenette and a sitting area. The private bathroom includes a hairdryer. 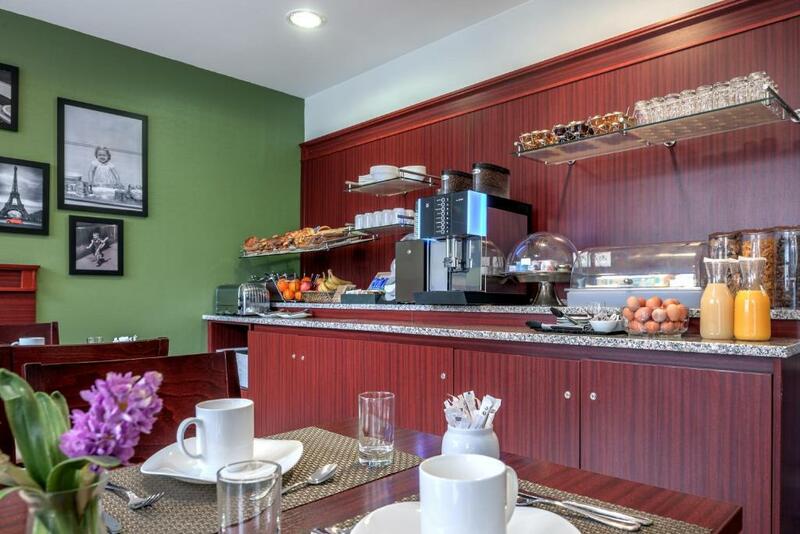 A continental breakfast is served every morning in the breakfast room at Citadines Didot Montparnasse. The front desk is open 24 hours and free internet access is available. The hotel is a 10-minute drive from the Parc des Expositions de la Porte de Versailles, and from Aquaboulevard Water Park. You may also choose to walk the 10 minutes to Alésia Church or access Parc Montsouris using the local tram system. 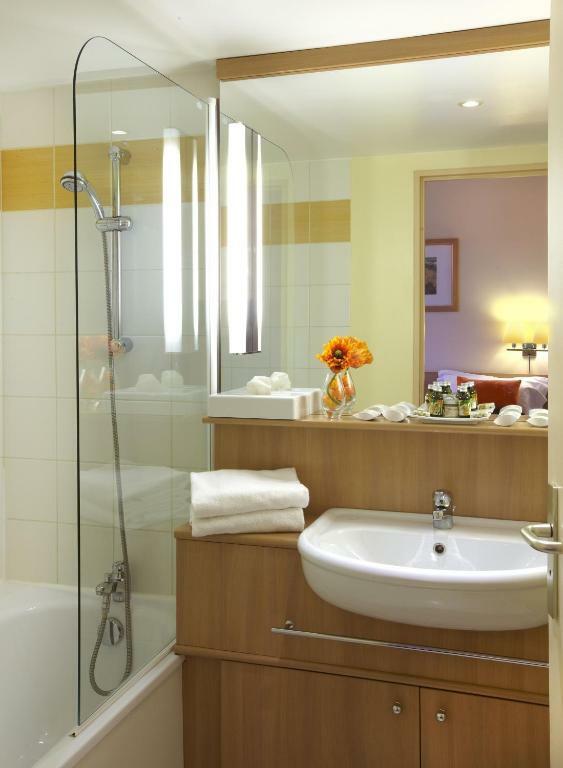 When would you like to stay at Citadines Didot Montparnasse? A fully-furnished apartment including free internet access and satellite TV. Air-conditioned studio with full kitchen with coffee maker, dishwasher, toaster and kettle. Equipped with free Wi-Fi, TV with satellite channels, safe, iron and ironing board. 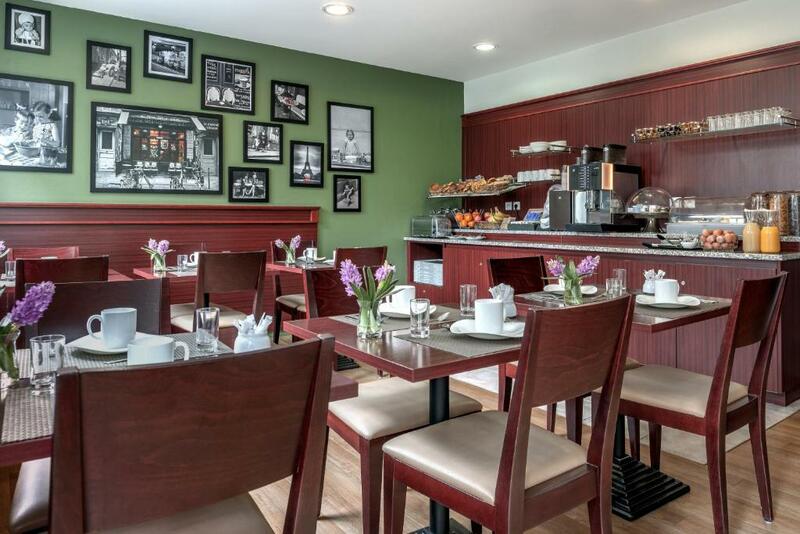 With the quiet of rue Didot to one side and the greenery of the garden to the other, your Apart Hotel offers you both comfort and convenience. The serviced apartments hotel is just ten minutes’ by car – or 4 tram stops – from Porte de Versailles and its Parc des Expositions exhibition centre, a year-round venue for major Parisian trade fairs. Area Info – This neighborhood is a great choice for travelers interested in monuments, museums and culture – Check location Good location – show map Guests loved walking around the neighborhood! House Rules Citadines Didot Montparnasse takes special requests – add in the next step! Citadines Didot Montparnasse accepts these cards and reserves the right to temporarily hold an amount prior to arrival. The room was to small No clinging service Beds to old I didn’t fill a sleep at all all my body was heart . The hotel is rated as 3 star !! The charged me €75 for 3 days parking!! I really doesn’t no what’s this 3 star is for expect bed ? For price would expected more in coridor smelled like someone has been smoking ,carpet and walls dirty ,but apartment inside was good overall ,clean bedding and towels,kitchen had all what we needed kettle,microwave and fridge,cups,plates,spoons,forks etc..
We had garden side room which was quiet . This was our second stay here and yet again we were not disappointed. Yes we know the rooms are not the height of fashion and a little outdated but they are clean and have everything you need. The beds are still so comfortable and the bedding as good as any 5 star hotel. The rooms are quiet and warm. You can prepare your own meals and relax in your room after a busy day sightseeing. I particularly enjoy the recent access to UK BBC TV in the rooms. The service is excellent ,the price such a bargain and we will be back for a third stay soon I am sure. Just a hand wash sink in the toilet would have been much better. We could'nt try breakfast this time because of our tight scedule but will definetly try next time, one of the convenient location to stay as well. Breakfast Cafe is too small, people some time need to wait. Breakfast and next door supermarket. A bit far from metro - 500-650 meters depending on the station, also a bit far from tourist attractions. Wherever we went (except Tour Montparnasse) it took us about 30-40 mins. Nonetheless we will stay here if we visit Paris again. Excellent value for money. The apartment had everything we needed. It even had dishwasher. Pretty spacious, too. Endless hot water and good water pressure in the shower. 2 elevators. Friendly staff. Free coffee in the hall. Breakfast provided at 10 eur extra. Big room as for Paris. Nice location - food store in same building (with gluten-free bread and cookies and it works Sunday evening! ), 1km (10-15 min walking) from two metro stations: Alesya and Pleisance, two different metro lines - very convenient when you are planning to travel all around Paris. And I feel safe when walking around late evening. It's a bit noisy but I wear earplugs anyway, so not much bothered. Breakfast a bit limited as for 10 euro (I'd like to see more cheese and egg options), but room has a kitchen so I consider breakfast as back-up option, not everyday use. Coffee is very good. 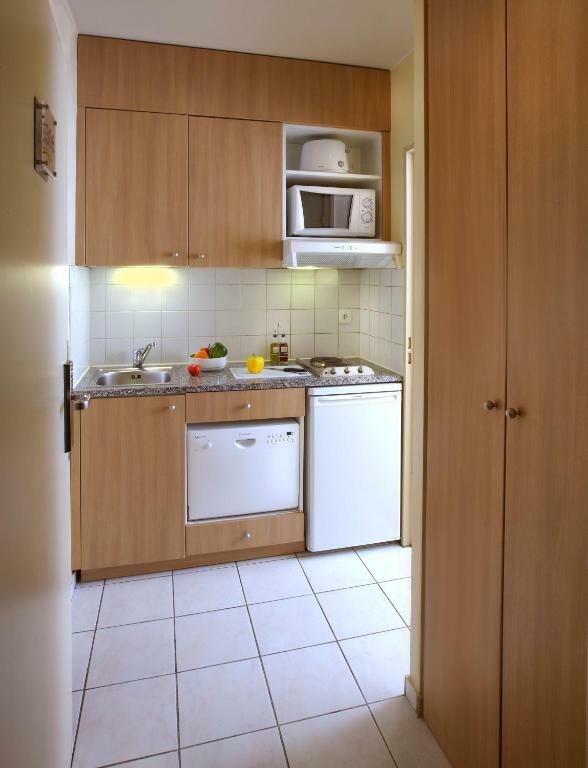 Kitchen has microwave oven, electrical kettle, fridge, dish washer - all that you need for short stay. Room is not cleaned unless you stay more than 6 days but honestly I feel more safe when nobody enter my room during my absence. Good price/comfort ratio. Perfect for all our needs. The bed was quite possibly the most comfortable ever, with bedding fit for a luxury hotel. Everything clean, room quiet and warm, kitchen facilities excellent. Faultless ! !